chicken burgers are pretty stinking awesome. they’re healthy and fun to make on your own. i found this recipe from rachael ray and it’s a winner! you can get the canadian bacon at your local deli counter, sliced to about 1/2″ thick. i also recommend making 5 burgers instead of the 4 that the original recipe calls for. preheat grill pan, to medium high heat. add 2 tbsp evoo and canadian bacon. warm bacon and caramelize it at edges. 1 to 2 minutes on each side. remove to a piece of foil. fold foil over loosely to keep warm. combine chicken, paprika, poultry seasoning, grill seasoning, shallot. score meat with the side of your hand to separate into 5 equal amounts. make 5 large patties. 3/4″ to 1″ thick. drizzle patties with oil and place on hot grill pan, griddle or in skillet. cook 5 min. on each side, until chicken is cooked through. top patties with reserved cooked canadian bacon and cheese. cover loosely with tin foil. turn off pan and let cheese melt, 2 min. combine mayo, mustard, tarragon. 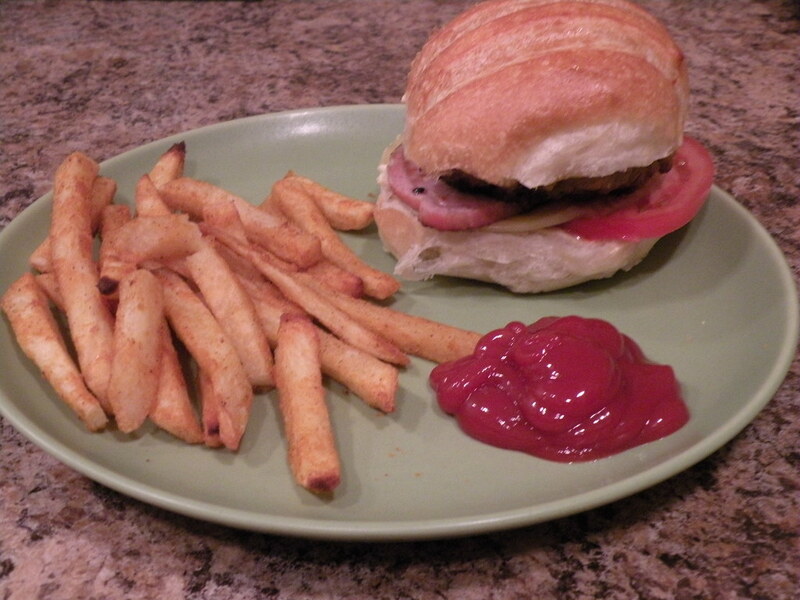 assemble burgers and serve with oven fries.